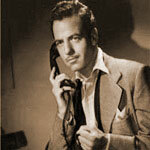 Adventures of Philip Marlowe was an detective drama broadcast from 1947 to 1950 on CBS and NBC. The program was based on the novels of Raymond Chandler, an influential crime writer of the time. Gerald Mohr played the hard-boiled detective Philip Marlowe. Gerald Mohr gave Marlowe one of the most distinctive voice in the air. His brassy, deep, and authoritative voice carried the charm of the narrative. Each show opens with Marlowe's signature line, "Crime is a sucker's road, and those who travel it end up in the gutter, the prison, or an early grave."